"We're not looking for her, gentlemen. We're only seeking a reasonable facsimile." One of the great mysteries of the 20th century surrounded the fate of Anastasia, youngest daughter of Czar Nicholas II. Although the Romanov family was believed to have been killed by the Bolsheviks, there were persistent rumors that Anastasia had escaped the executioners and had been seen in a variety of places. In 1928, a woman calling herself Anna Anderson surfaced claiming to be Anastasia herself. For decades litigation and controversy surrounded her claim. A fictionalized version of her story was made into a hit stage play, and adapted into this film classic. In 1928 Paris, Anna Koreff (Ingrid Bergman) is spotted by a consortium of Russian emigres, led by General Sergei Bounine (Yul Brynner). This enterprising group has sold shares in a company to track down Anastasia and claim the ten million pounds held for the czar's family in the Bank of England. Using Anna's resemblance and the fact that while in a mental asylum she claimed to be Anastasia, Bounine, Chernov (Akim Tamaroff) and Petrovin (Sacha Pitoeff) work to remake the suicidal and confused Anna into the Grand Duchess Anastasia, drilling her on court conduct and facts about the royal household. Initial attempts to convince the Parisian Russians of her genuine character are inconclusive, so Bounine decides to bet everything on convincing the Dowager Empress Maria (Helen Hayes) that Anna is in fact her granddaughter. But when Anna appears to know things that only Anastasia herself would know, questions begin to rise in Bounine's mind about exactly who it is that he has been trying shape. This film marked the first return from exile by Ingrid Bergman, expelled from the US for having an affair with director Roberto Rossellini. Although her casting was protested across the country, her performance (which garnered a Best Actress Oscar®) as the confused and vulnerable Anna won over the public handily. 1956 was titanic for Brynner, with starring turns in this, The King and I and The Ten Commandments, all in the same year. He was also nominated for an Oscar® for this role (but won for The King and I). He is quite the equal of Bergman, displaying many sides to Bounine's character, from the rogue to the determined general, to the flamboyant showman, to the sensitive man falling in love with his protégé. In support, the great Helen Hayes again takes on regal airs as the Dowager Empress. Her scenes with Bergman are highly affecting and memorable as the lonely old woman desperately looks for signs of her beloved granddaughter. Tamaroff is a splendid character actor and does a fine job as the nervous Chernov. The only weak note is the portrayal of the Dowager's son, Prince Paul by Ivan Desny. He is quite colorless and hardly seems to make a plausible romantic interest for Anastasia. Natalie Schafer (Mrs. Howell of Gilligan's Island makes a brief and hammy appearance as one of the Russian emigres. The direction is fairly pedestrian until we get to the scenes involving the exiled Russian nobility; then the splendor of days gone by comes alive and the camera and production values really light up. Arthur Laurents' screenplay provides a number of hooks for the sensitive, such as the search for family and identity that have made this picture a beloved classic. At the same time, this emotional grounding is offset by the extreme cynicism and manipulation of Bounine and Chernov. Anna also proves to be a formidable lead character, who becomes increasingly difficult to control, causing the best laid plans to go astray. But most important is the thematic notion of the will to believe: the need of people to believe that such a thing could be true, and their determination to reach that conclusion in the face of obvious facts (such as the fact that the real-life Anna Anderson never spoke Russian). The concept brings into question all manner of beliefs, including religious faith (defined by Twain as believing in things you know ain't so). The wide Cinemascope screen is well filled by the pageantry and parades. Bounine's restaurant with Russian orchestra and gypsy singers also provides interesting visuals as does the grand ballroom of the Dowager Empress. Whatever one thinks of Anna's claims, the film is a fascinating and involving story. Image Transfer Review: The Cinemascope anamorphic transfer is nearly flawless. There are hardly any visible defects (other than a couple of mildly jumpy splices). Color is very good and blacks are rich and solid. Shadow details are a bit on the plugged up side. The frequent reds look quite good; in particular the beautiful main titles over the double-headed eagle of the Czars look first class. Audio Transfer Review: The original four-channel soundtrack is represented here in 4.0 Dolby Digital. There is very nice directionality as characters move across the screen. This is particularly well displayed in an exceptional scene where Brynner and Bergman are both offscreen at opposite sides of the wide screen, with the empty adjoining room filling the screen. The directionality is perfectly suited to conveying this imagery. Sound is clean, with only nominal hiss and noise that will be noticed only on extremely critical listening. Alfred Newman's score has good presence, as do the frequent Russian tunes. The 2.0 Spanish and French tracks sound abysmal; if the English track sounded like these, a major restoration was undertaken. Extras Review: As usual, Fox provides an excellent panoply of extras in support of the feature. 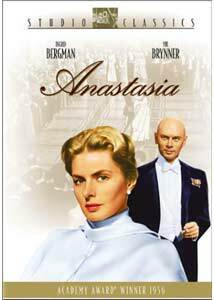 Most interesting is the A&E Biography episode devoted to Anastasia; most of the first half is devoted to the real (brief) life of the Grand Duchess, while the balance is devoted to Anna Anderson and her claims. The episode contains part of the solution to the mystery of Anna Anderson, and another part is related in the commentary, which is up to Fox's usual high standards for this series. Screenwriter Arthur Laurents provides interesting details from the shooting of the film, while some reminiscences are also provided by James Macarthur, son of Helen Hayes (best known as Dan-O on Hawaii Five-O). Edited among them are comments by writers Jon Burlingame and Sylvia Stoddard, the latter of whom is extremely enthusiastic about the picture and is a veritable fount of interesting information about both it and the case of Anna Anderson. It's highly enjoyable. The other extras are made up of six Movietone News fragments running from a few seconds to about two minutes each; four are related to the premiere of the film and the awards won by it and its cast. The last two snippets are of the Romanovs themselves in 1907 and 1917, although Anastasia doesn't seem to appear in this footage. An anamorphic trailer in beautiful condition for the feature is presented, but its transfer is not up to the same quality of the film itself, since there is frequent compression ringing visible on the trailer that is not otherwise visible. Trailers for eight other films in the Studio Classics series are provided, as is a restoration comparison that shows the severe fading that had afflicted the negative. The 1991 transfer is greenish and murky and suffers from severe gatefloat, while the colors in the restored print (the restoration was done to the film as well as the video) are vivid and stable. Chaptering is a little on the thin side. The subtitles are a very close transcription. Fox hits another one out of the park with this entry in its Studio Classics series; with a beautiful restoration, the original four-channel audio, a splendid transfer and useful extras, this is another essential DVD.